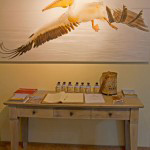 Henties Bay accommodation Guide - information and photographs of Fishermans Guest House Henties Bay Namibia. 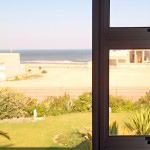 Welcome to Fishermans Guest House, enjoy a stay at Fishermans Guest House in the Henties Bay area of Namibia, all the information you need about accommodation prices how to book a room and directions to Fishermans Guest House Henties Bay Namibia. See you soon. Set in the magical town of Henties Bay. On the shore of the Namib Desert. 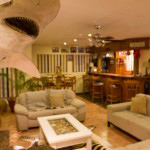 Fisherman’s Guesthouse welcomes fishermen and tourists alike. 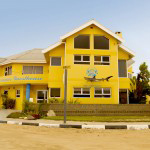 The guesthouse is the ideal base from which to experience a shore angling adventure of a lifetime. 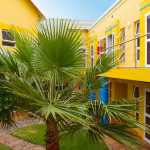 This beautiful guesthouse offers unforgettable accommodation a mere 200 m from the Beach. Listen to the sea, enjoy the fresh air, cool evenings, good company, fine wine and well prepared meals in the comfort of our dining room and bar. Comfortable beds in 9 tastefully furnished, spacious, north-facing double rooms are a promise of a refreshing nights sleep. 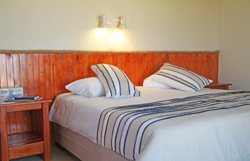 At Fisherman’s Guesthouse we have lovely standard and spacious luxury rooms. All our nine rooms have an en-suite bathroom, some with shower, some with bath. 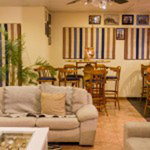 In your room you will find a ceiling fan, mini-bar, shaving plug, coffee-and tea facilities, a hairdryer, telephone and a television with selected satellite television-channels. The small town of Hentiesbaai is located at the famous Namibian Skeleton Coast, only 60km from the touristic Swakopmund and 90km from the harbour town Walvisbaai. Namibia has with almost 1600km some of the longest coastlines in Africa. Hentiesbaai is mainly known for its unique fishing spots, ask any Namibian and he will tell you that the best places to fish from the shore are in the area of Henties. This makes it the more popular place for the Afrikaaners wherefore it is also frequently referred to as the “Boere-Bahamas”. Prices are staring prices given as a guide only, actual price may vary depending on availability. A 50% deposit is required to hold your reservation with balance payable 10 weeks before your travel date. Bank transfer, credit and debit cards accepted for pre-bookings. Paypal available on request. This information is currently being updated, please check again later. There are no reviews yet, please check again later.